» What’s the Key to Beating Miami? What’s the Key to Beating Miami? 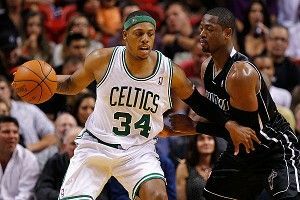 The Boston Celtics beat the Miami Heat 115-107 Tuesday night. For Boston, this game was won in the area between 16 and 23 feet from the basket. According to NBA.com, 31 percent of Boston’s shots came from that distance, and they made 59.3 percent of those attempts. 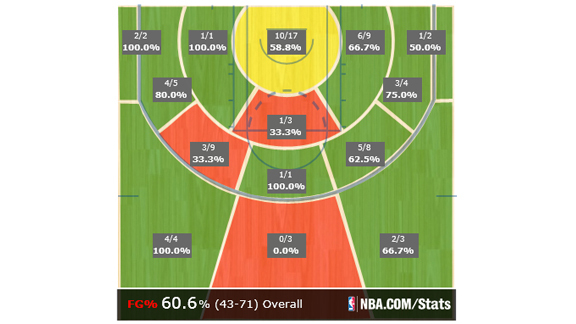 Here is Boston’s shot chart from the game. Some observers might be tempted to say that Miami forced Boston into several long 2s — the toughest shot in the game — and Boston just hit them. But that’s not the case. 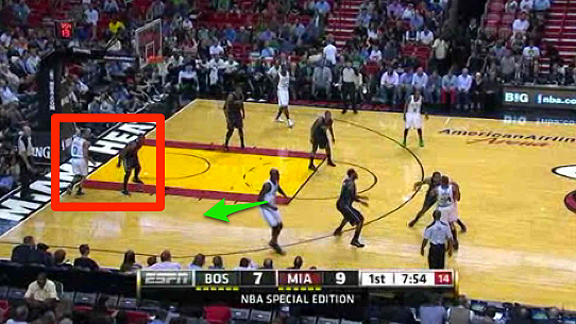 Miami didn’t force Boston into difficult mid-range jumpers. Instead, the Celtics were creating wide-open looks in the 16- to 23-foot area and knocking them down. 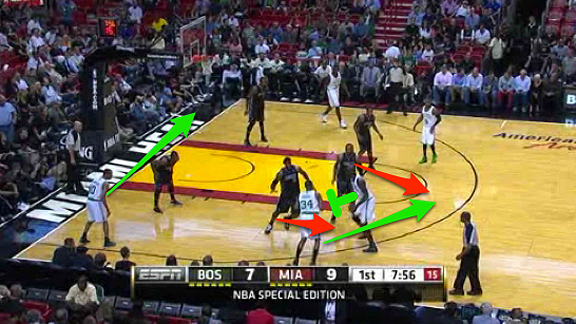 Was this poor defense by Miami or sound offensive strategy by Boston? In my opinion, it was both, and Boston’s strategy might become a blueprint for other teams to use against the Heat — if they have the personnel to pull it off. How did Boston get so many open jumpers? Of Boston’s 16 makes, 10 came from screens. First, let’s examine how Boston used ball screens to create open jump shots. This is where Boston matches up best against Miami. Running the pick-and-pop is the Celtics’ strength and defending against it is one of Miami’s most significant weaknesses. Here we see Kevin Garnett with the ball at the top of the key. He swings it to Paul Pierce and follows his pass, then sets a ball screen for Pierce. As Pierce comes off the screen, the Heat hedge hard. Ronny Turiaf jumps out to trap Pierce while LeBron James fights around the screen to complete a double team. As this happens, Avery Bradley runs to the weak side to give the Celtics better spacing. After setting the screen, Garnett pops instead of rolling to the rim. This is important, because the way Miami defends pick-and-rolls makes popping out more effective than rolling. Miami’s ball-screen defensive rotation scheme relies on guards to step up and cover the screener, who is left open when his defender shows hard against the ball handler. The help guards sag toward the middle to protect the rim, so when the screener rolls to the basket, he cuts right into the help defense. When the screener pops, however, he forces the rotating guard into a long and difficult close-out. Pierce handles the trap well and passes to an unguarded Garnett. To challenge KG’s shot, either Dwyane Wade must rotate out from under the rim or Turiaf must hustle back from the trap. Neither happens fast enough, and Garnett knocks down the shot. Here is the play live. The Heat, with their all-world athletes at both wing positions, usually do a fantastic job of closing out against shooters, but sometimes their defense is just too stretched out for James or Wade to cover all that ground and challenge the shot. In the playoffs, a good pick-and-pop team could give Miami serious trouble. Boston’s success running the pick-and-pop Tuesday night opened up other opportunities on the weak side. Look at this example. The play begins like the last one, with Brandon Bass swinging the ball to Pierce and then setting a ball screen for him. This time, Garnett is on the weak side. Even before Bass pops out, Garnett’s man shades over to protect the lane, which leaves two Heat defenders to cover three Celtics on the perimeter. The result? Another open jumper for Garnett. When the Celtics weren’t running pick-and-pops with their big men Tuesday night, they were running “floppy sets” for Ray Allen (and, occasionally, Pierce). These sets give Allen multiple screens away from the ball and let him pick which ones he wants to use. Allen feasts off these floppy sets, where you basically give him three screens, a double on one side and a single on the other, and he moves without the ball to create an opportunity. This is Ray Allen at his best. He fakes going off the double screen, then starts to use the single, and then at the last second he plants his foot, turns around, and curls off the double screen. It works. Allen gets open and knocks down the mid-range jumper. Once Allen establishes that shot, the defense starts to overplay him to stop it, and the other Celtics benefit. Most often, the player who sets a curl screen for Allen gets open when his man takes one too many steps away from him to make sure Allen’s curl doesn’t lead to an easy bucket. In this play, the screener is Greg Stiemsma. He sets the screen for Allen, who uses it and gets the ball. He’s not open for the shot because Turiaf steps out to make sure Allen isn’t left open after the curl. Allen passes back to Rajon Rondo, who hits Stiemsma for an easy jump shot. Allen wasn’t the only Celtic who hurt Miami on curl screens Tuesday night. Paul Pierce got his, too. Watch this play. This play unfolds almost exactly like the previous one, except that here Pierce passes to the screener (Garnett) because Chris Bosh shows hard against Pierce after the curl. Another open shot and another make for the Celtics. Allen’s movement without the ball is so effective, in fact, that it’s not just the screener who gets open because of him. Sometimes, Allen’s movement forces all five defenders to keep an eye on him, and it creates opportunities on the weak side. Here, Pierce passes to Rondo at the elbow. Pierce then runs to the corner and sets a screen for Allen. This gets Bosh and James to start watching the action on the strong side. As soon as that happens, Garnett sets a pin-down screen for Bass on the weak side. Because the Heat were ball watching, they don’t see this screen coming, and Bass gets an open jump shot because of it. Yes, Bosh closes out, but he gets there late and Bass hits the shot. Were all of Boston’s long 2s lucky? I wouldn’t say so. They came from good execution and taking the opportunities that the Miami defense leaves open. Now, not every team will be able to match up so well against the Heat. To be successful like Boston was, you need a pick-and-pop big man. The Pacers have David West, but their point guards might not be able to handle traps as well as Rondo and Pierce. Indiana also lacks a second shooting big man to stretch Miami’s defense. So which teams can duplicate Boston’s success? Chicago might have a chance, and they play the Heat tonight. They have decent pick-and-pop shooters in Carlos Boozer and Taj Gibson, and of course they have Derrick Rose, who the Heat will need to trap aggressively if they want to prevent him from scoring off ball screens. Chicago also has Kyle Korver, who might be the second best behind Ray Allen at getting open off curl screens and passing out of them. In tonight’s game, it will be interesting to see if the Bulls use Gibson and Boozer in pick-and-pops and if Korver will zig and zag off curl screens on the baseline. If they execute, the Bulls should get a lot of open looks and give themselves a great chance to win.